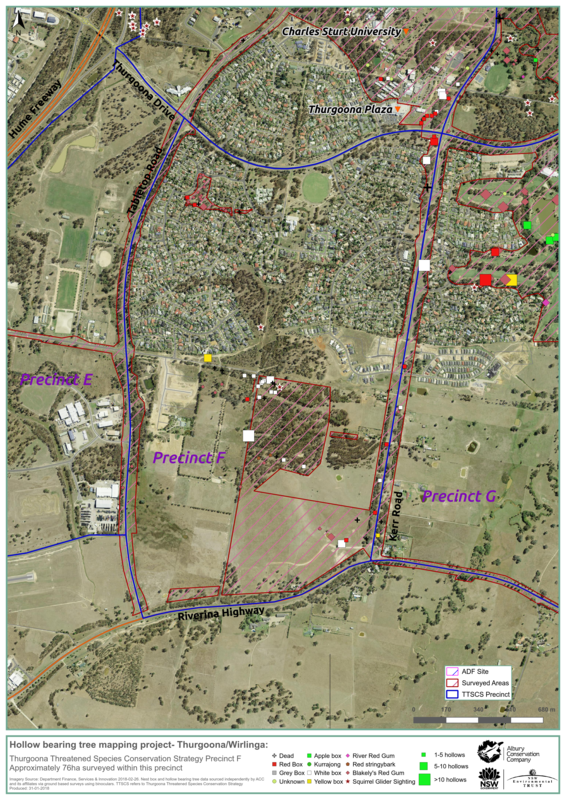 Since July 2015, Albury Conservation Company has been locating mapping Hollow-bearing trees (HBTs) throughout Thurgoona/ Wirlinga. 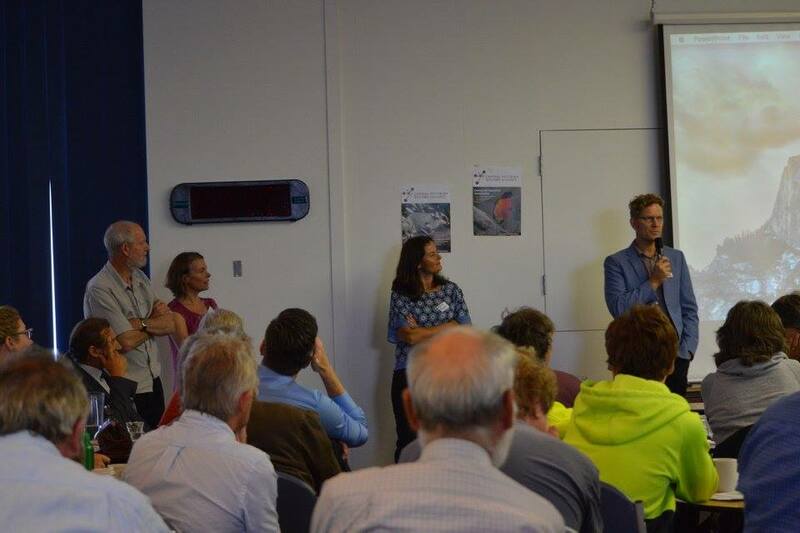 The project has been funded by the NSW Government’s Environmental Trust. The project finished at the end of February 2018. 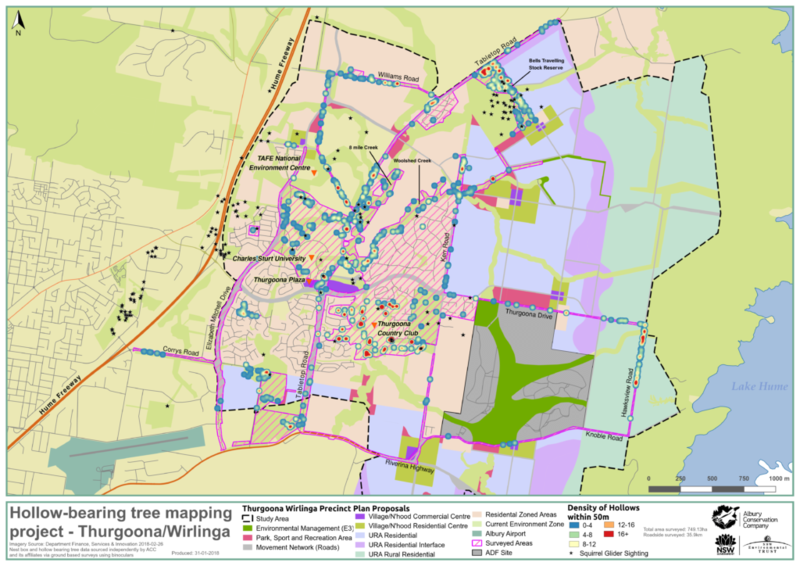 523 hollow-bearing trees have been located and mapped across Thurgoona / Wirlinga, the major urban growth corridor of Albury, NSW. 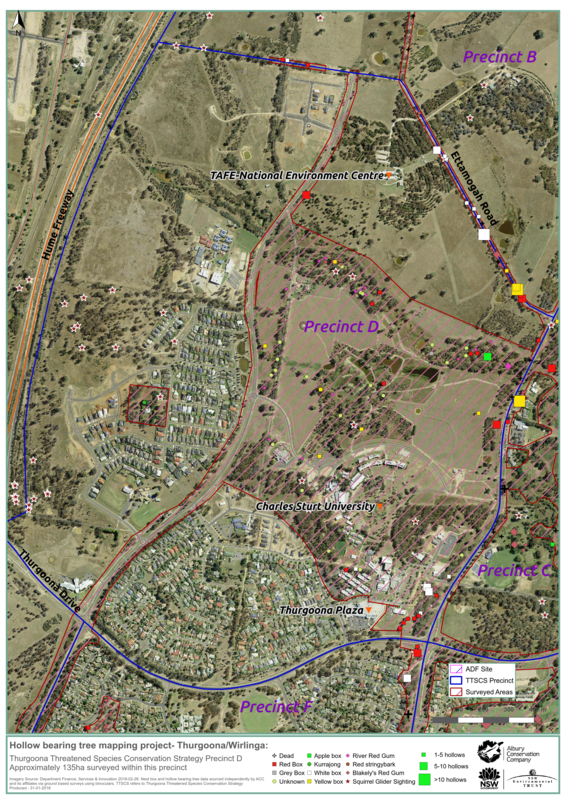 This data set significant adds to the records of 135 HBTs that were mapped at Charles Sturt University and Thurgoona Country Club Resort in 2012 and 2013, activities initiated and funded by Albury Conservation Company. 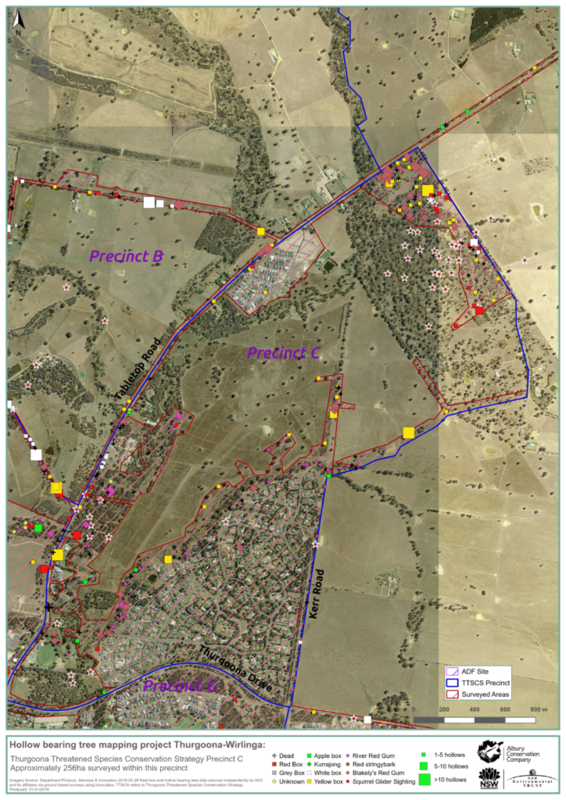 750 hectares of land have been mapped, including 35 km of roadsides. 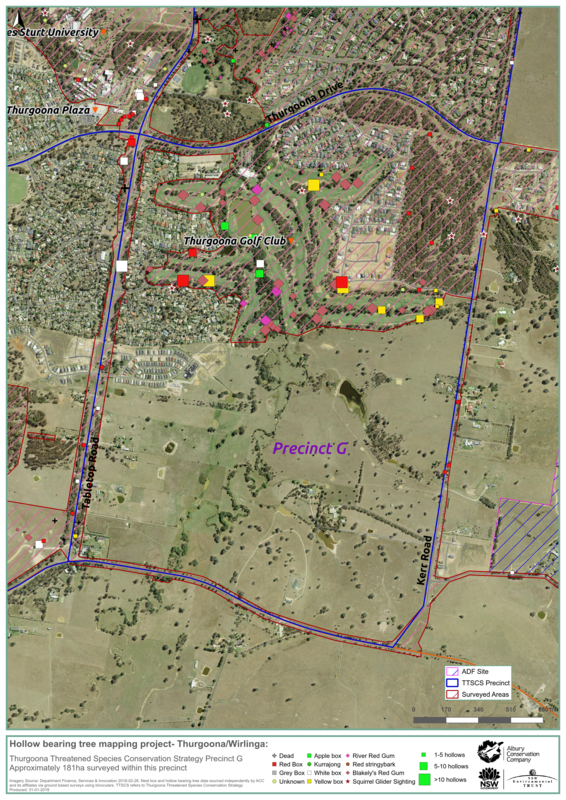 The HBT data and photos collected have been supplied to Albury City Council for the establishment of a significant tree overlay on their internal mapping software. The data is utilised by Planning and Environment staff when assessing Development Applications (DAs), and during the planning of infrastructure (e.g. new road construction). Consultants working on behalf of developers also have access to this data. 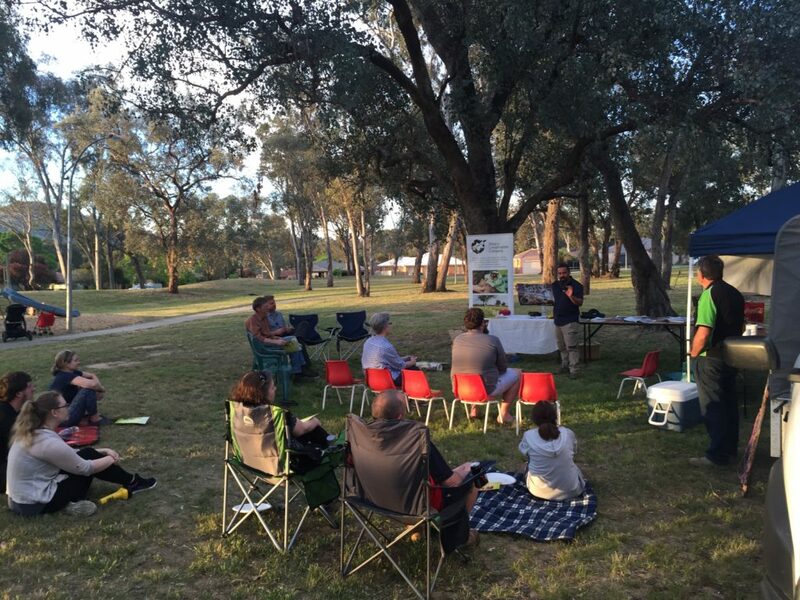 Dr Damian Michael presenting at ‘Holloween’, a community event in Thurgoona sharing results from the hollow-bearing tree project and conducting a search for hollow-dependent fauna (10/11/2017). 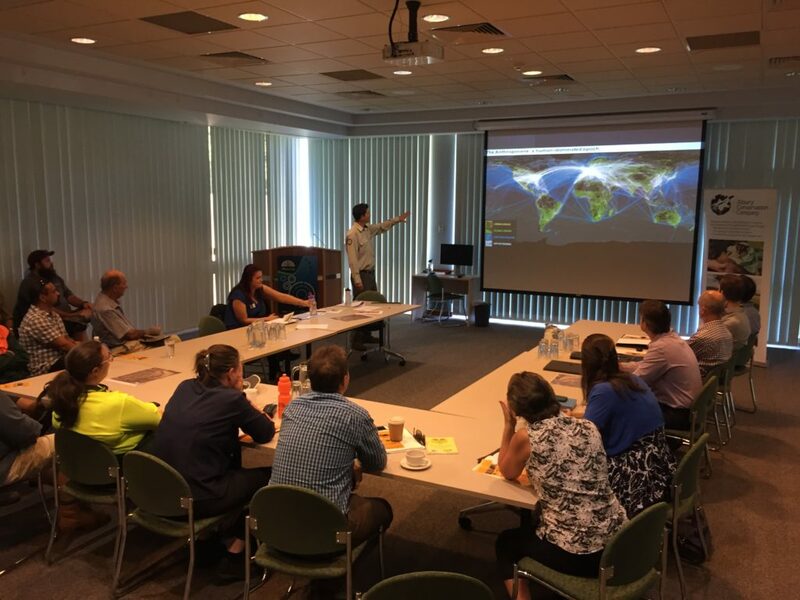 Hollow-bearing Tree (HBT) Workshop, Albury – Presentation by Dr Darren Le Roux (ACT Government) on managing old trees in urban growth areas of Canberra. 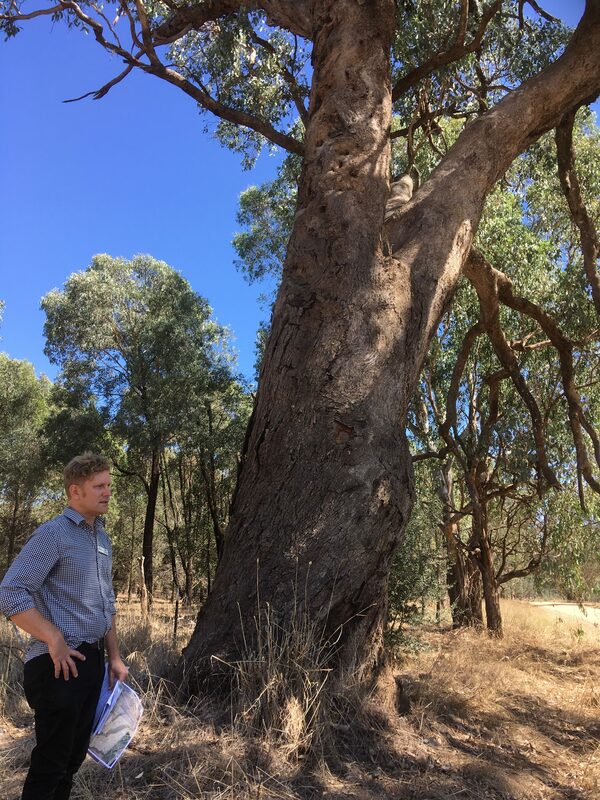 Albury Conservation Company’s coordinator, Sam Niedra, speaking on the Hollow-bearing Tree Workshop site tour about this huge Eucalyptus albens (White Box), located on Ettamogah Rd and recorded as containing the highest number of hollows (24). 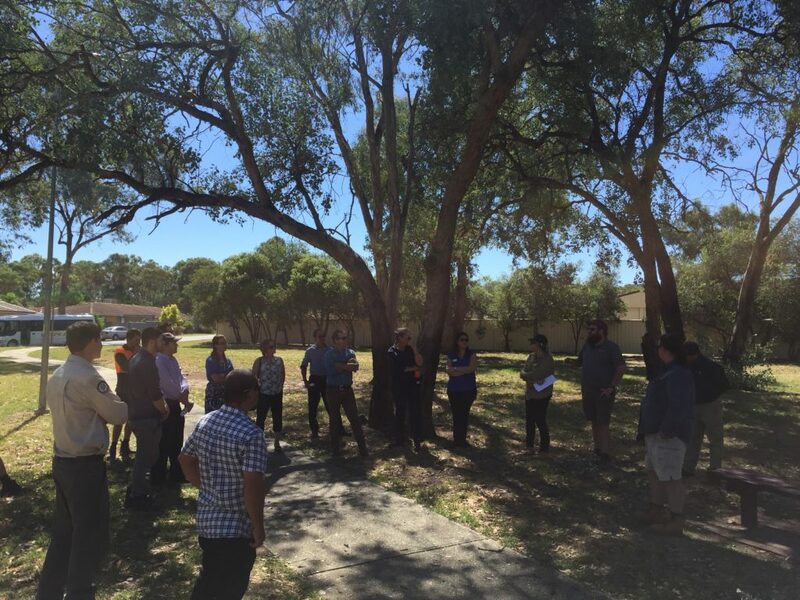 Hollow-bearing Tree (HBT) workshop, Albury – site visits around Thurgoona / Wirlinga including Bishop’s Walk Park. 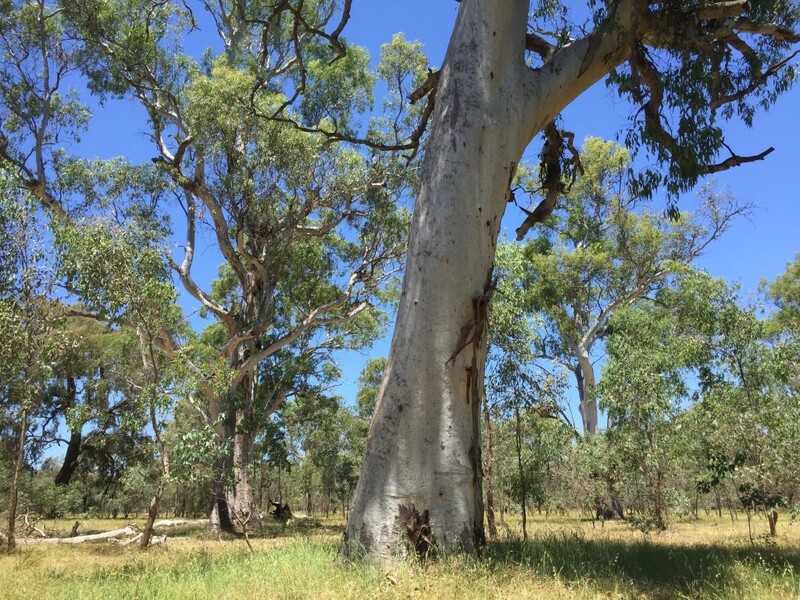 523 Hollow-bearing trees (HBTs) have been located and mapped across Thurgoona/ Wirlinga, by Albury Conservation Company and supported by NSW Department of Industry – Lands. 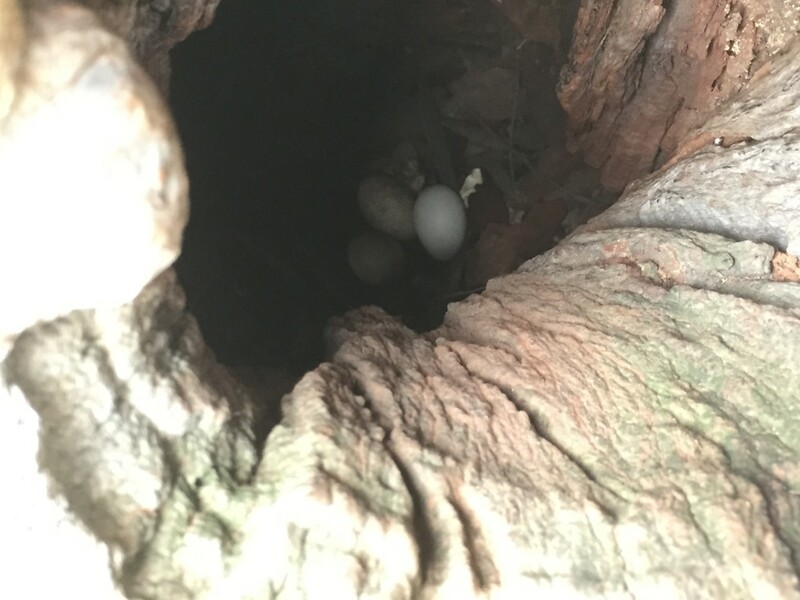 Information has been captured using ground-based surveys with binoculars, and relates to species, number of hollows, diameter at breast height (DBH), and noting whether the tree is alive or dead. Many have also been photographed as a visual record. A Hollow-bearing tree (HBT) mapping overlay has been created by Albury City Council using the data provided by Albury Conservation Company. The overlay, on Council’s weave mapping software, is available for easy reference by Council’s Environment and Planning staff. 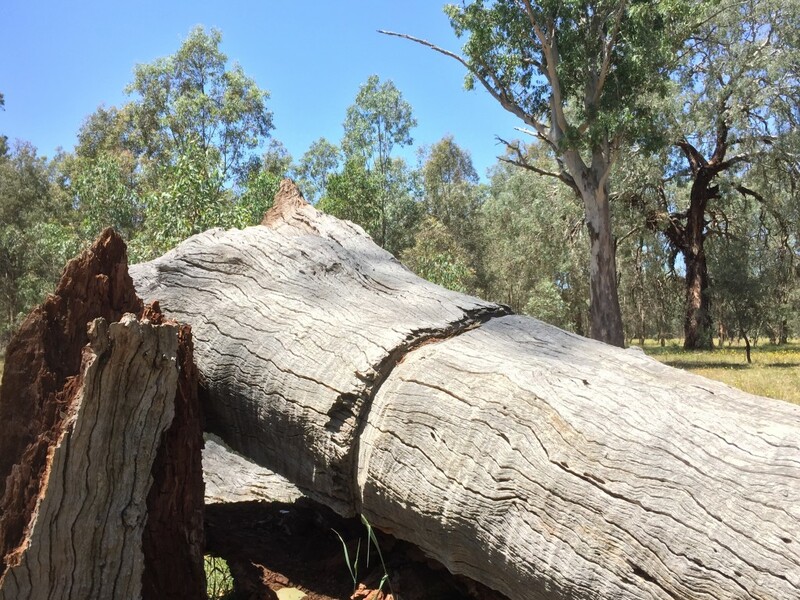 Thurgoona / Wirlinga has a drastic shortage of hollow-bearing trees. In relatively undisturbed woodland, the expected number of HBTs per hectare is between 7 and 17. 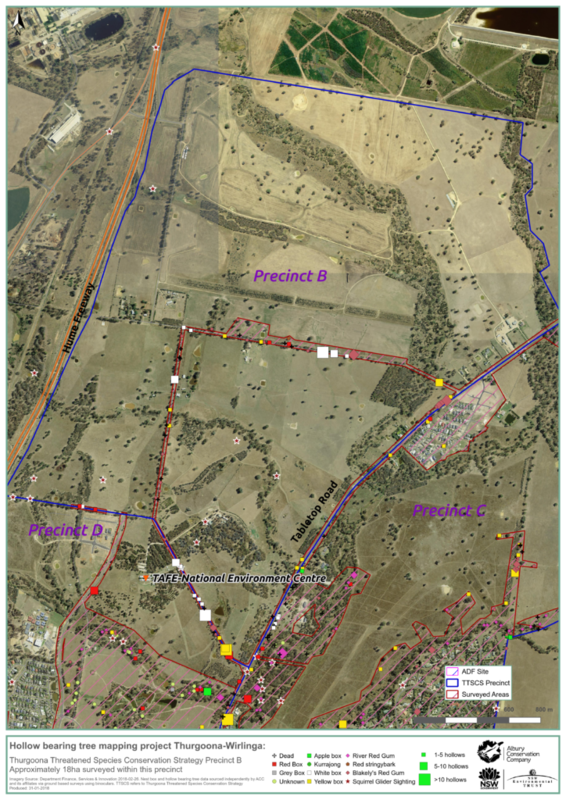 Albury Conservation Company has found that the highest density in Thurgoona / Wirlinga is 3.5 HBTs per hectare, which was found in Bell’s TSR and a small section of Corry’s Woodland. This is unsurprising given that Bell’s TSR is the only E2 (Environmental Protection) zoned land in the study area. 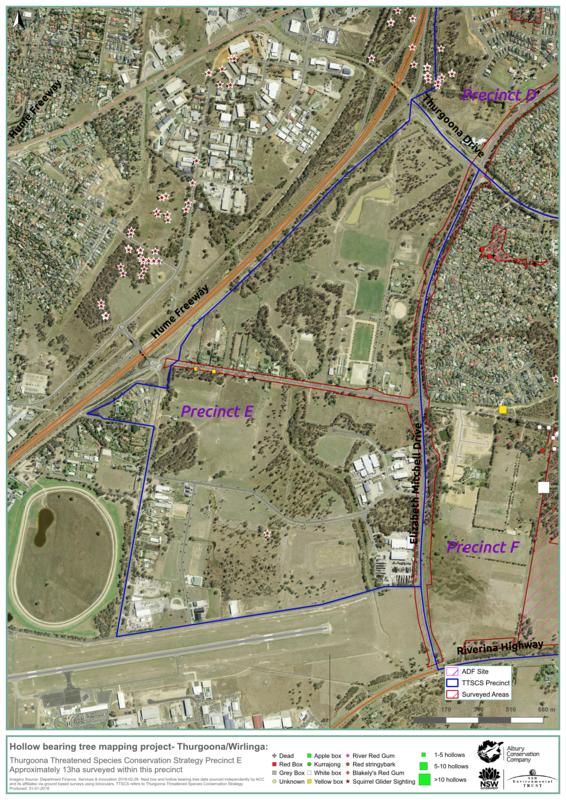 Woolshed Creek and Eight Mile Creek, between Table Top Rd and Kerr Rd, contain on average just under 2 HBT’s per hectare. 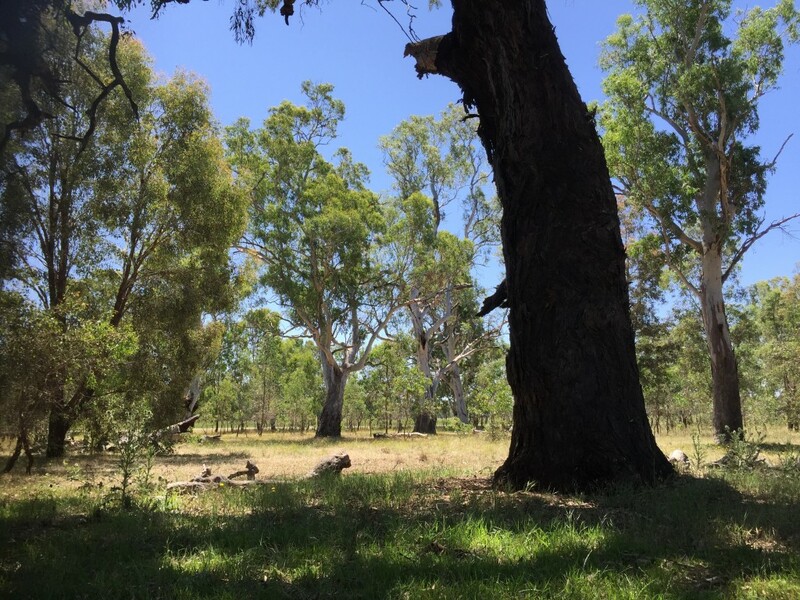 The study highlights the importance of retaining as many of the remaining hollow-bearing trees that we can, and that includes hollow-bearing trees found on land zoned for residential and commercial development. 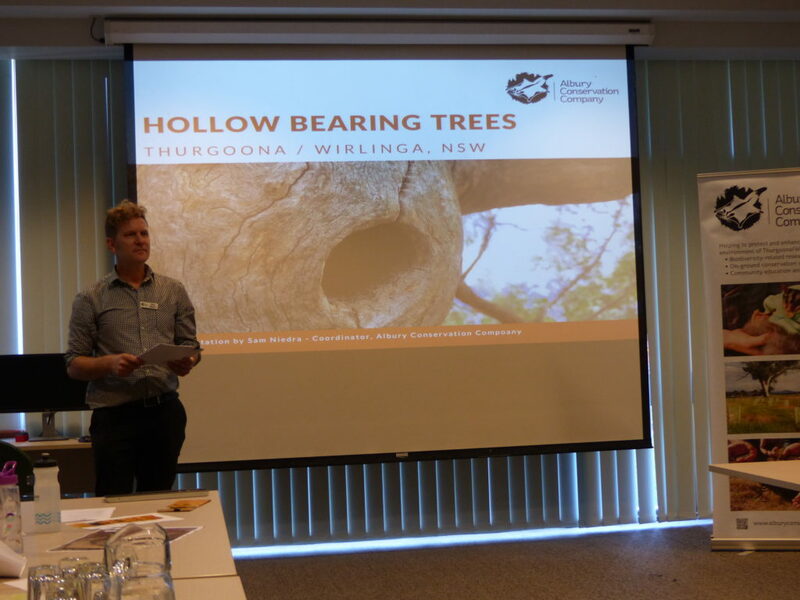 In July 2015, Albury Conservation Company (ACC) commenced an exciting and innovative project focussing on hollow-bearing trees, arguably the most important natural asset in the Thurgoona / Wirlinga landscape. ACC gratefully received $54,560 from the NSW Government’s Environmental Trust (Education Stream) to deliver the two-year project. 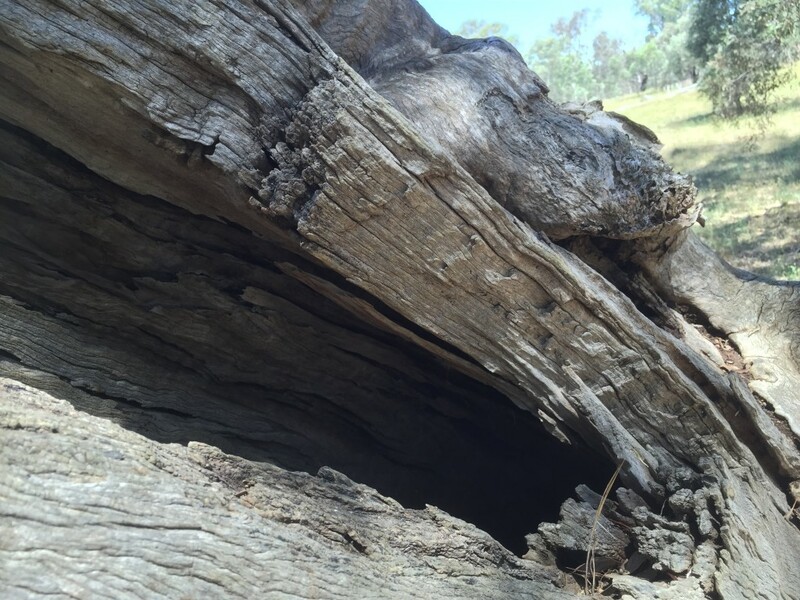 The project, entitled Urban Developers constructing a hollow future for Albury’s wildlife, aims to increase retention of hollow-bearing trees (HBTs) in Thurgoona/Wirlinga through collaboration with key stakeholders involved in the urban development process, including Albury City Council. 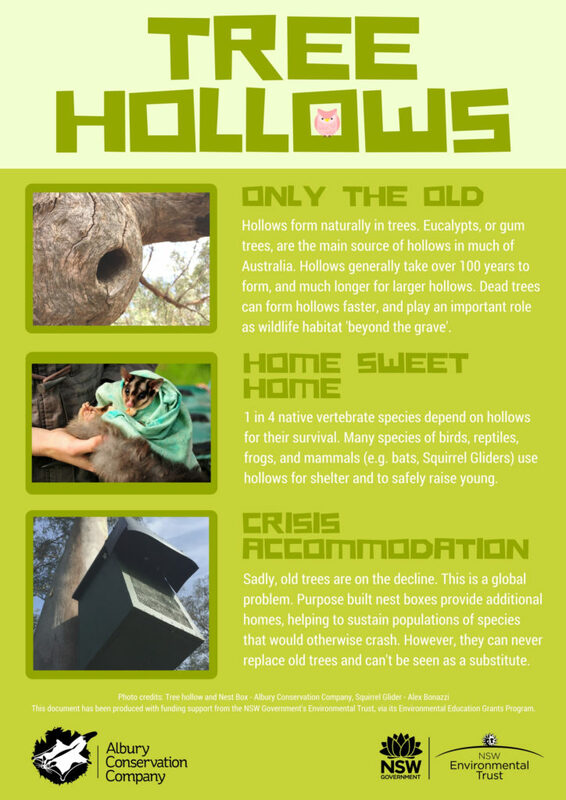 Naturally occurring tree hollows are vital for the survival of many wildlife species, providing homes for 1 in 4 native vertebrate animals. 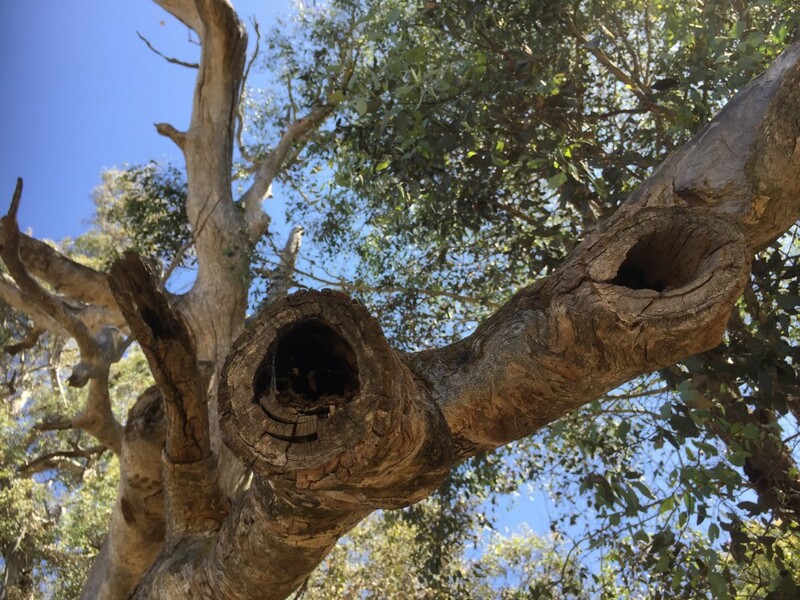 In NSW alone, species reliant on tree hollows for shelter and nests include at least 46 mammals, 81 birds, 31 reptiles and 16 frogs (Gibbons and Lindenmayer 1997, Gibbons and Lindenmayer 2002). Of these, 40 species are listed as threatened under the NSW Threatened Species Conservation (TSC) Act 1995. Loss of hollow-bearing trees is listed as one of the 36 key threatening processes under the TSC Act. 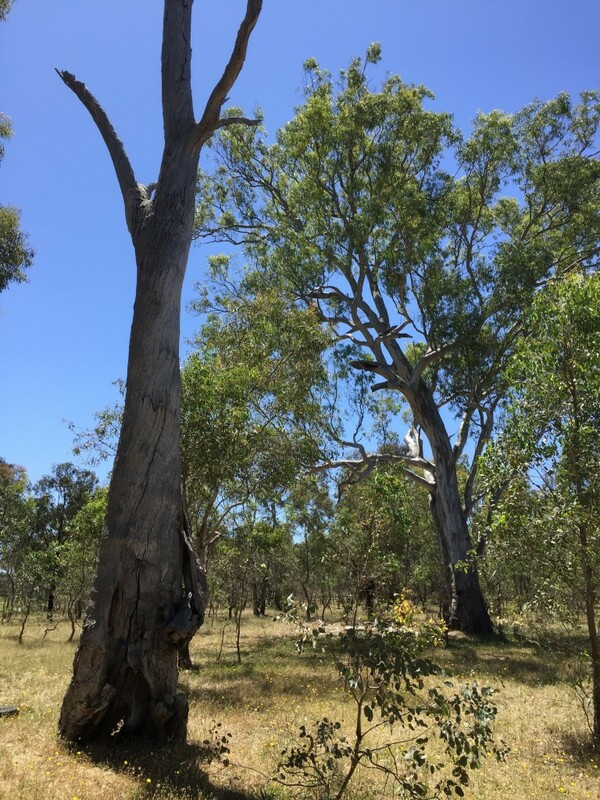 In Thurgoona / Wirlinga hollows are a valuable habitat resource for Squirrel Gliders, woodland birds, bats, reptiles, and other fauna. Currently there is minimal documentation regarding their distribution, attributes, and utilisation by fauna. 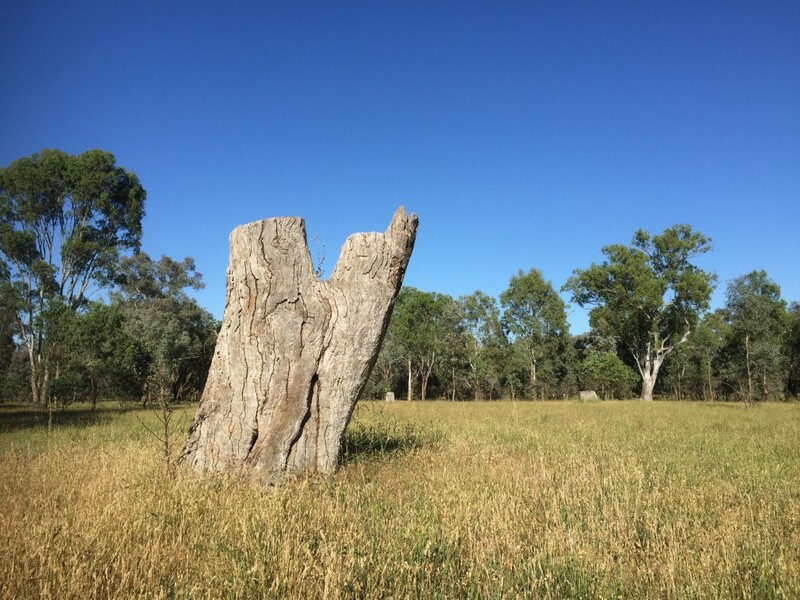 Recording and monitoring hollowing-bearing trees will be an important first step in helping to conserve this valuable resource and to improve biodiversity management in surrounding areas. Tree hollows take a very long time to develop. Sadly, they can be taken from a landscape in an afternoon. 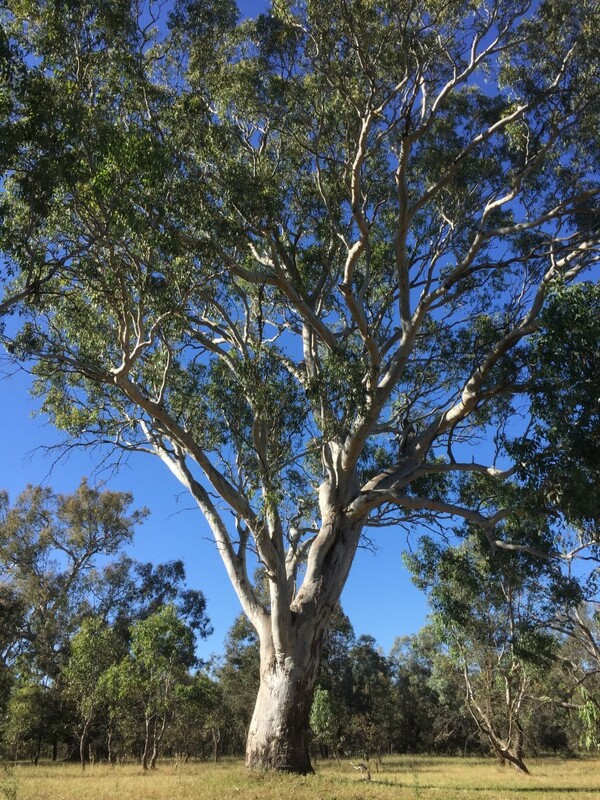 Eucalypts, or ‘gum trees’, are the main source of hollows in Australia, as is the case in Thurgoona / Wirlinga. 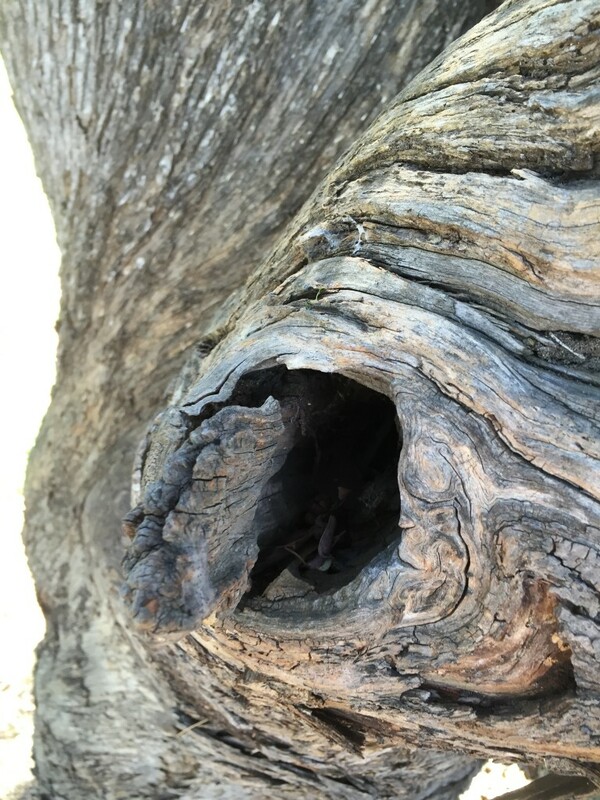 Hollow formation in Eucalypts generally take 120-180 years to produce hollows of sufficient size to house mammals (Gibbons & Lindenmayer, 2002), such as the threatened Squirrel Glider. 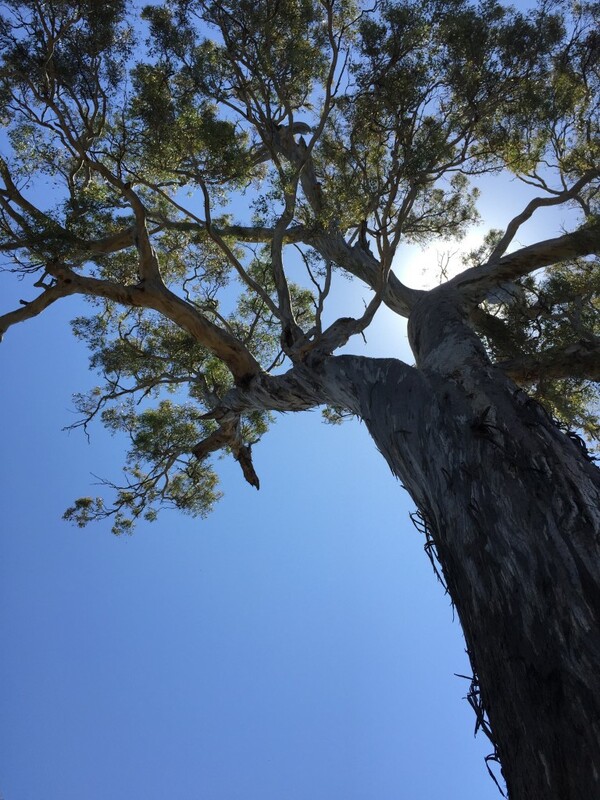 The protection of hollow-bearing trees in the Thurgoona / Wirlinga area will be essential if the community is to ensure that we maintain viable populations of many local threatened species, including the Squirrel Glider, well into the future. The tree is walked around and observed from as many angles as possible. 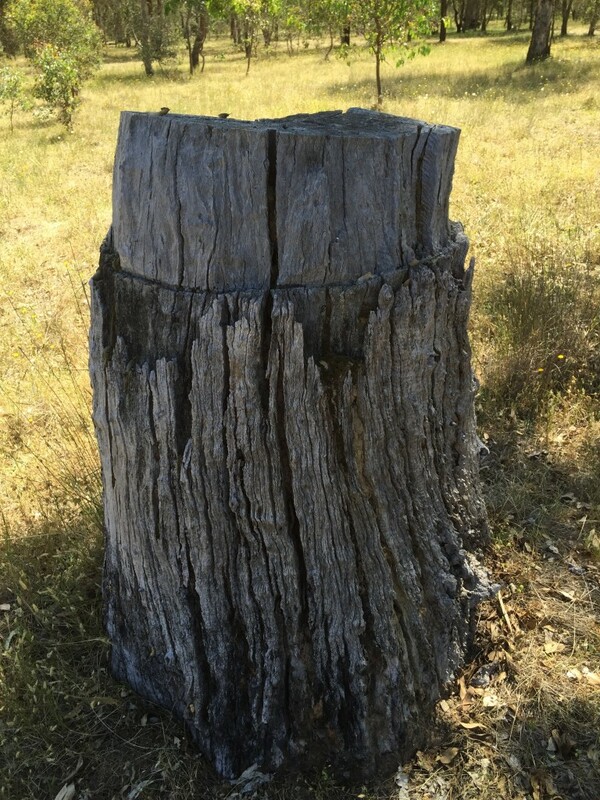 A tree is recorded as bearing hollows only if an actual hole is observed. Potential hollows facing upwards are not recorded. Each tree generally takes 10 minutes to observe and capture data. 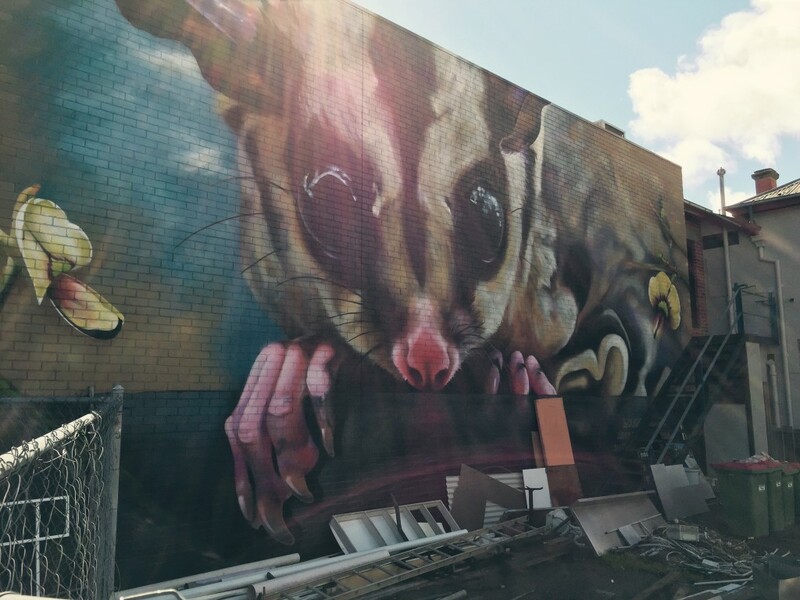 Upcoming event – 31st August 2018 – Squirrel Glider search party!